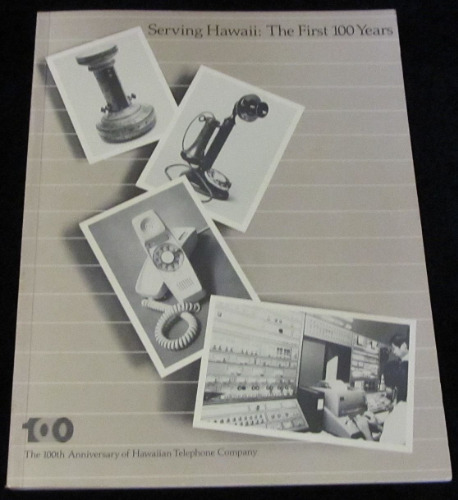 Softcover (8 1/4 x 10 3/4), Hawaiian Telephone Company/Edward Enterprises, Honolulu, 1983. 88 pages. B/W photos. The history of telephone use in the islands from its introduction in 1878 to the present. Vintage photos and document facsimiles accompany the informative text. From King Kalakaua signing the charter to let the telephone company do business in Hawaii and all the logistic dilemmas that came with implementing the system; to the ever-advancing technologies experienced in the quickly-changing Hawaiian Islands to the present.